I can’t exactly remember the first time I heard someone refer to their parent’s sister as an “Ont”, but I was probably still a kid and it was probably said by a character on a television show. It might have been All in the Family or The Jeffersons, but in my heart I know that it was actually Sanford and Son. Man, but I loved Sanford and Son! Ted Turner‘s local Atlanta channel WTBS was a big part of growing up in Atlanta, and that station introduced my generation to re-runs from a previous generation – shows like Gilligan’s Island and I Dream of Jeannie, as well as Hogan’s Heroes and The Andy Griffith Show. Thanks to these reruns there was a lot of continuity in America’s “monoculture” between the late 1950s and the 1980s. I can’t recall the year that it started, but at some point TBS (as we knew the station) eventually settled into a long run of Sanford and Son episodes. Every night of the week around dinner I would sit with my parents and we would laugh along with all of Fred’s crazy adventures. The 70s was a weird and wonderful time in America. The topics of race and place had escaped onto the airwaves in very complex and adult ways, and even though I was too young to understand it all I was soaking up ideas that had not been so openly a part of the national conversation for quite some time. I knew from all the grown-up talk on “the Archie Bunker show” that there was supposed to be some big difference between blacks and whites, but none of that mattered to me while I was watching Fred Sanford – I just identified with that funny old junk dealer and his poor son, Lamont. The only thing that really seemed out of place to me was when his son Lamont would refer to his Aunt Esther as “Ont Esther”. I didn’t understand why he was trying to make that word sound so fancy!! 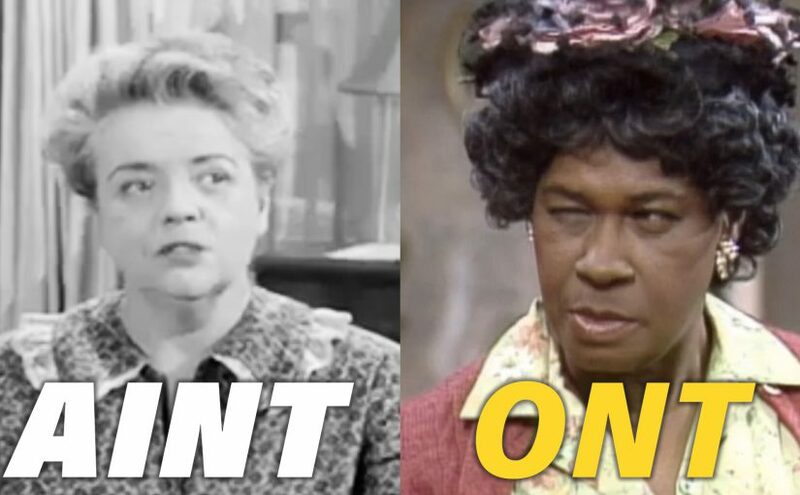 Didn’t Lamount know that the correct pronunciation of “Aunt” was “Aint”, like Andy Griffith used with his Aunt Bee on The Andy Griffith Show??? I mean, I had certainly learned to pronounce that word as “Aint” when referring to my own Aunts, just from listening to Andy. Ont? It just sounded so… silly. As I grew older I eventually heard the word pronounced as “Ant” in various non-Southern television series and that’s the way that I began to use it with some of my Aunts. The u must have been silent. As I reached adulthood my pronunciation of the word ‘Aunt’ changed to suit my idea of each and every aunt. Some became “Ants” while others remained “Aints”. Some I referred to simply by their first name, but none of them was ever an “Ont”. For a short spell I wondered if “Ont” was a pronunciation that only black people used, but as I began to meet and work with more and more people from around the country I was able to observe that these friends also pronounced it as “Ont”, regardless of their race. It began to seem far more likely that “Aint” was more of a white Southern thing – more isolated and unusual – which only served to push the pronunciation “Aint” even deeper into a hidden, colloquial vocabulary that I only felt safe using when in the presence of my family (or southern movie truck drivers) who sounded an awful lot like my family. This hidden Southern vocabulary included referring to my parents as “Momma” and “Daddy” and the classic Southern terms like “dutton” and “wutton”. I wutton going to blog this much tonight, but it dutton really matter because not all that many people read my posts anyway. Besides, I’m sleepy.